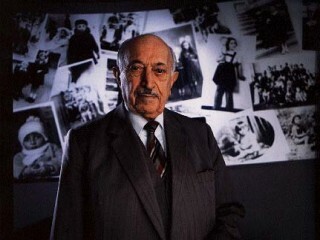 Simon Wiesenthal , born December 31, 1908 in Buczacz, Kingdom of Galicia, Austria-Hungary - died September 20, 2005 in Vienna, Austria was an Austrian-Jewish architectural engineer and Holocaust survivor who became famous after World War II for his work as a Nazi hunter who pursued Nazi war criminals. Of Simon Wiesenthal and his book The Murderers among Us: The Wiesenthal Memoirs, a Time reviewer writes that most "survivors of Hitler's death camps want nothing more than . . . to forget the horror of the war years and leave revenge to God or Israeli agents. Not so Vienna-based Simon Wiesenthal, . . . the dogged detective of genocide who, since he walked out of the Mauthausen concentration camp in May 1945, has run to earth 800 Nazi war criminals." Wiesenthal's memoirs recount his activities as a Nazi-hunter since his liberation. As Alexander Donat notes in a Saturday Review article, Wiesenthal was employed right after the war by the War Crimes Commission, the U.S. Office of Strategic Services, and the Counter-Intelligence Corps. In 1947, says Donat, "he set up a small Documentation Center on his own in Linz, Austria, and continued it later in Vienna, where he gathered more documents, photographs, and affadavits. His card index of Nazi criminals . . . contains [over] 22,500 names." The Murderers among Us, according to Donat, "reads like a fascinating detective thriller. Sickening at times, it eventually provides the warm satisfaction of following a righteous job well done. You just can't lay the book down until it is finished." Wiesenthal's work as a Nazi-hunter, says Donat, "proves the dismal failure of the Germans in cleaning their own house. Had the postwar Germans (and Austrians) devoted to the Nazi search one hundredth of the energy the Gestapo had used in order to locate and send to death one single hidden Jewish child, a Wiesenthal would have no raison d'etre. His very existence is Germany's shame. And viewed against this background his book and his activity acquire an entirely different dimension. It mirrors the depth of the German tragedy, which is also the tragedy of Europe." Born December 31, 1908; died September 20, 2005, in Vienna, Austria; son of Asher (a businessman) and Rosa (Rapp) Wiesenthal; married Cyla Muller, September 9, 1939 (died, 2003); children: Pauline Rose, Kreisberg Gerard. Education: Attended University of Prague, 1929-33; University of Lemberg, Engineer-Architect, 1939. Religion: Jewish. Memberships: Association of Jews Persecuted by the Nazis (president), Union International des Resistant et Deportes (Brussels; past Vice president), Federal Association of Jewish Communities of Austria (past vice president), B'nai B'rith. Diploma of Honor of International Resistance; Needle of Honour, Austrian Resistance Movement; Diploma of Honour, League of the United Nations; Freedom Medals of Netherlands and Luxembourg; Dr. honoris causa, Hebrew Union College, Hebrew Theological College, Colby College, and John Jay College of Criminal Justice of the City University of New York; named Commandeur of Oranje-Nassau, Commendatore de la Republica Italiana, and Commandeur de ordre pour la merite; Congressional Medal of Honor; Jerusalem Medal. Practicing architect in Lemberg, Poland, 1939-41; arrested in 1941, and spent World War II years in Nazi concentration camps of Janowska, Lwow, Gross-Rosen, Buchenwald, and Mauthausen; employed by War Crimes Commission, U.S. Office of Strategic Services, and Counter-Intelligence Corps, 1945-47; set up and directed the Jewish Documentation Center in Linz, Austria, 1947-54, he building up a vast network of documents and informants to bring Nazi war criminals to justice; directed a number of Jewish welfare agencies in Linz, 1954-61, before establishing the Jewish Documentation Center in Vienna, Austria. * KZ Mauthausen (title means "Concentration Camp Mauthausen"), Landes Verlag, 1946. * Grossmufti-Grossagent der Achse (title means "Head-Mufti, Head-Agent of the Axis"), Ried Verlag, 1947. * Ich jagte Eichman (title means "I Hunted Eichmann"), Siegberg Mohn Verlag, 1961. * (Editor) Verjaehrung? (title means, "Limitation? "), Europaische Verlagsansertalt, 1965. * The Murderers among Us: The Wiesenthal Memoirs, introduction and biographical note by Joseph Wechsberg, McGraw, 1967. * Die sonneblume, Hoffman & Campe Verlag, 1970, translation by H. A. Piehler published as The Sunflower, W. H. Allen, 1970. * Segel der hoffnung: Die geheime mission des Christoph Columbus, Walter Verlag, 1972, translation by Richard Winston and Clara Winston published as Sails of Hope: The Secret Mission of Christopher Columbus, Macmillan, 1973. * The Case of Krystyna Jaworska, Becht Verlag, 1975. * Max and Helen, Morrow, 1982.